Modern furnishings - Clean and elegant. The perfect kitchen - brand new Counter seating for casual dining. Sit down dining - bright and inviting. Main level guest bath. Open floor plan. Carpeted stairs to slumber land. Level three hallway access. Level three Master Suite with king bed. Master Suite attached bathroom with step in shower. Level three guest bedroom with queen bed. Hall access guest bath with deep soaking tub and shower combo. Level three guest bunk room Bunk room accommodates 4 in twin beds. Main level is living, dining and kitchen. First level front door and garage to foyer entrance. First to second floors and second to third floors each have two landings. There are two landing between each level. Artists rendering - Alpine and Silverpine Village courtyard. Artists rendering - view from highway. Unit 333 is in middle of photograph. It’s brand new, it’s fabulous and its on the miracle mile high! Sunset and Pine has a long history, just ask the local wildlife. The not so shy deer, fox and the errant raccoon will be showing off their luxurious furs and are sure to make an appearance alongside the two legged, cotton clad wildlife seekers that frequent this centrally located condominium complex. Sunset and Pine is a comfortable space that is simply furnished with modern décor for clean and elegant lines. The living space has a propane heat stove for year round warmth. The chef du jour will appreciate the efficient, modern kitchen with gas stovetop and plenty of workspace and kitchen counter seating. There is also a dedicated dining area for all of your guests. Balcony access from the living area has a gas grill and great view of the Alpine Village Courtyard. This is a perfect perch for witnessing year round music and fun events hosted at the Village including the popular Monster Dog Pull during Winter Carnival. Accommodate up to 8 adventure savvy guests with three bedrooms and 2 1/2 bathrooms. The quiet, third level of this home has the master suite with a king bed and an attached bathroom with walk in shower. Bedroom two has a queen bed and bedroom three is a bunkroom with two, twin over twin bunk sets. The hallway access bathroom has a deep, soaking tub/shower combination. Like any location in McCall, you are never more than a five minutes drive from back country access into the Payette National Forest and you are always just two blocks from Payette Lake beaches and downtown McCall shopping and dining. Let your parking angel focus on other things, the two car garage is guaranteed down town parking and keeps you out of the weather. Step out your door and you are within walking distance to everything. The hubbub at Sunset and Pine is the perfect place to see the stars. Paparazzi are welcome but please don’t feed the fur clad residents – keep the wildlife wild. Note: that this is a three story property that does not have an elevator. The garage is on the ground floor, living area, kitchen and dining areas as well as a guest bathroom are on the second floor. All three bedrooms are on the third floor. Your worry free, DoneRight Management Vacation Rental is equipped with linens, bath towels and essentials that include guest soaps, shampoo/conditioner and hair dryer as well as Kitchen essentials and towels. To start your vacation off right, we’ve provided a days worth of supplies including your morning coffee, papertowels, bathroom tissue and garbage bags. 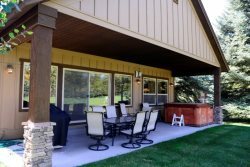 Also provided where required is propane for gas grills, and enough wood for fireplace use during your stay. For properties with a fire pit, you can purchase wood at several local stores. Our little guests are important too, most homes include a pack n’play, high chair, booster seat and baby gate. Please check the amenities sections for the property you’ve rented on our website as you may have to bring some of these items with you. Each DoneRight Management Vacation Rental has a guest book complete with information and tips unique to your lodgings, suggested activities and events, local emergency contact information including how to contact us. We’re always just a phone call away. McCall is a mile high city located at the north end of Long Valley in Valley County, Idaho. We are surrounded by the Payette National Forest and enjoy access in all directions. Nestled in the Mountains with the natural gem, Payette Lake, at their base allows vacationers countless opportunities to discover and explore the outdoors. Lake and river fishing, boating, downhill and Nordic skiing, snowmobiling, hiking, biking or soaking at one of several hot springs in the area bring our guests back year after year all year long. Savor an alpine summer sunset from your balcony or deck or lakeside at Legacy Park. Hell’s Canyon National Recreation Area or the Frank Church Wilderness are both just a scenic, 90 minutes drive east or west.